UNITED NATIONS, August 16 -- Two months after the premiere of the film "Killing Fields" about Sri Lanka including a critique of the UN's weak performance under Secretary General Ban Ki-moon, Inner City Press asked Ban's acting deputy spokesman "Yes or no: has Ban Ki-moon watched 'Killing Fields of Sri Lanka'?" Weeks ago, the UN told Inner City Press that a DVD of the film had been given to Ban Ki-moon and that he would watch it when he had time. When Ban returned from his native South Korea, he went on vacation (or, "intends to have some time off this week," as Haq described it). On August 16, Haq having canceled the day's UN noon briefing told Inner City Press by e-mail: "He has received a copy of the film from Channel 4." Given the way the question was asked, we read this answer as "No," Ban has not watched it. 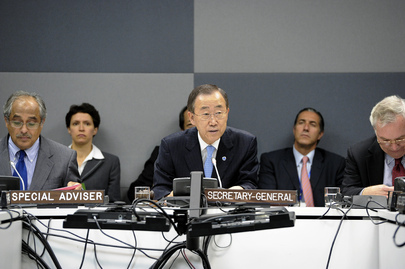 This stands in clear contrast to Ban's August 11 letter to the director of the film "The Whistleblower," also criticizing the UN but for a time period before Ban Ki-moon took over, as noted under the heading "Ban confronts a sordid chapter in UN's history" in Foreign Policy which received the letter. Why has Ban watched The Whistleblower -- with his senior advisers, no less -- and not "Killing Fields of Sri Lanka"? The latter's critique of the UN, in 2009, Ban is in fact responsible for. The other he can lay off to another time, and claim he is fixing the problem. Ban's letter doesn't say if his chief of staff Vijay Nambiar was one of the senior advisers with whom Ban watched The Whistleblower. More than one source has suggested that Nambiar might be behind Ban not commenting on, or even apparently watching, Killing Fields of Sri Lanka, given among other things Nambiar's involvement in the so-called white flag killings depicted in the movie. While Ban on August 11 wrote that he is asking the President of the General Assembly to sponsor a screening in the UN of The Whistleblower, he has not even transmitted the Panel of Experts' report on Sri Lanka to the UN Human Rights Council. Haq on August 15 said that still might happen in the future. Maybe after Ban finds the time, with or without Nambiar, to watch a movie that critiques his UN's performance? We'll see.